In the last post about Writer’s Bloq, I had announced I’d deliver snippets about the Kickstarter campaign all week long. 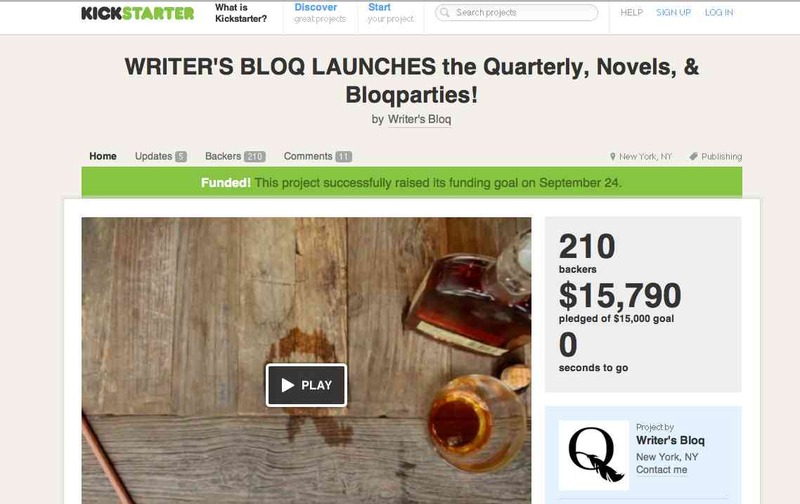 But, by the next day, Writer’s Bloq met the goal of raising $15,000. There’s this piece of me that aches at the thought of missing out on these events. If I weren’t shackled to my husband and kids in Miami, I’d be making plans to journey to at least one. So, to all of you who enjoy the freedom that I don’t, take a moment for yourself and click your way into a writer’s haven. There will be plenty of art, drinks, literary mingling, and more. Thanks for sharing the information. Shall possibly try to make it at NJ (or NY) if time permits. Yes, that would be great. You have to tell me how it went if you do go. Sorry for the delayed response. I’m beyond tired from teaching. Wonderful they met their goal.. Wish I could attend!!! That’s how I feel too. Anything that celebrates the word needs to be honored. Nice, how amazing when people put effort in an idea, together, they can move mountains! That’s the inspiration we all need to see and then do for ourselves. Thanks for sharing this. Its too bad you are shanked down. It would be great to meet at the Baltimore or DC event. I love blogging. But, one of the down sides is that you don’t get the opportunity to meet some of your favorite folks because of distance. Thanks for sharing this – I am going to try to attend one of the events myself. I am blogging party to be part of a community and this seems like a great way to find it! Good. I was hoping to get the word out to all the great writers I’ve encountered and really, I haven’t even scratched the surface of WordPress. It’s nothing less than a godsend. I know I’ve barely touched the surface. Anything that helps a writer find a voice and recognition needs to be shared.